Comments: Miletus Ballard Harris was born September 26, 1810, in Louisa County, Virginia, and was the son of Samuel and Lydia (Cole) Harris. On December 27, 1831, Miletus married Frances Caroline Grubbs, who was the daughter of Thomas and Martha 'Patsey' (Anderson) Grubbs of Louisa County, Virginia. 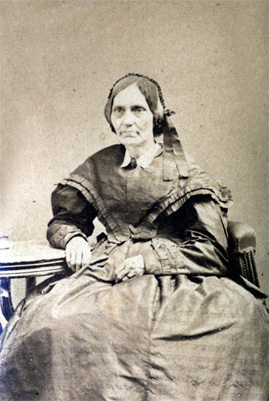 Frances Caroline was born May 5, 1810, in Louisa County. Miletus and Frances Caroline Harris arrived in Scottsville with their two young children in late 1837. They planned to relocate to the Ohio Valley where Miletus' wheelwright skills were much needed. Scottsville was a logical stopover on their wagon ride west, a place to stretch their legs and buy provisions. The first night they stayed with a Mr. Neuman, a local store owner who also had accommodations for travelers. The Harrises soon realized Scottsville held more opportunities for them than they had anticipated. Miletus was a wheelwright by trade and was greatly impressed by the heavy wagon traffic bringing grain from the Shenandoah Valley to Scottsville. Miletus and Frances Caroline visualized a prosperous future for them supporting waggoners passing through town, and Miletus set up a small shop in Scottsville. By 1860, Miletus had acquired all interest in the Neuman operations and became owner of the 'Harris Merchandising/Warehousing' company on Main Street that sold everything from clothing to wagon parts. Located near the James River and Kanawha Canal, the Harris business played an important role in the transfer of farm products to eastern ports as well as a source of manufactured goods needed by those returning by wagon to the Shenandoah Valley. Frances Caroline opened her own millinery shop on the third floor of the Harris building. As ardent Methodists, the Miletus Harris family must have found the strong Methodist congregation directly across from them on Main Street most attractive. The Harris family was active in the Scottsville Methodist Church, and their younger sons were all named for Methodist ministers. Before the church had an organ, Miletus led the singing by setting the pitch of each hymn with a pitch pipe. 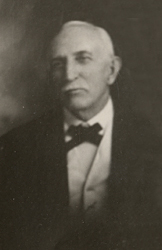 Miletus also served as the Methodist Sunday School superintendent for twenty-five years. Later his son, Charles, took over this church role and would walk across Main Street from his store to start the stove fire before Sunday services. Miletus' son, Henry, became the Methodist choir director after the war, and several of Miletus' grandchildren were talented church organists. Initially, the Miletus Harris family lived above their store on Main Street, but as their business prospered and their family grew, a larger home was needed. By the Civil War, Miletus and family lived in a two-story brick house next to the Scottsville Baptist Church. According to Albemarle County deed records, Mary Emory Hill purchased the Harris house on August 15, 1889. Mary was the wife of Major James Christian Hill of Scottsville, and thereafter the home was known as the Harris-Hill house. This home has since been razed, and that lot is now part of the Scottsville Baptist Church property. 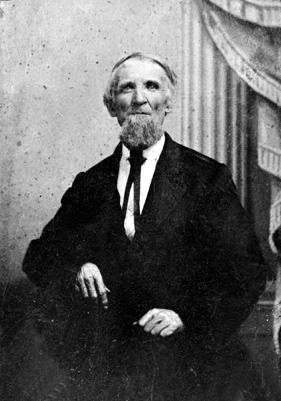 (1) Thomas Sidney Harris (1833-1875) - Thomas was born on March 26, 1833, in Louisa County, Virginia. Although the Harris family Bible lists his middle name as 'Samuel,' he was known as Thomas Sidney Harris. He attended the University of Virginia and often brought a student or two home with him on visits. Thomas always told Mollie, his sister, if one of the students were engaged to be married lest she lose her heart to the young man unaware. Thomas loved to play his violin as Mollie played the piano and sang. After UVA, Thomas went on to Jefferson College in Philadelphia, Pennsylvania, where he was awarded a medical degree on March 11, 1854. He was practicing medicine in Pine Bluff, Arkansas, in 1857, when his mother made an arduous trip by 'the cars' to visit him after Mollie's wedding. On March 31, 1861, Thomas married Mary A. Holmes in Dallas County, Arkansas, and they were the parents of four children: Sidney, Flora, Eugene, and Henry Harris. During the Civil War, Thomas was a surgeon for the Confederate Army. After the war, he practiced medicine in Little Rock, Arkansas, where he died on May 12, 1875. Thomas Sidney Harris is buried in Princeton Cemetery, Dallas County, Arkansas. 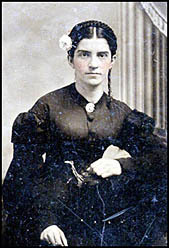 (2) Mary Susan "Mollie" Harris (1837-1909) - Mollie Harris was born April 20, 1837, in Louisa County, Virginia. On November 1, 1857, she married David Nicholas Patteson, who was a young clerk in her father's store. Born in 1834, David was the son of John Lee and Jane (Morris) Patteson, who resided at 'Glenmore' in Buckingham County, Virginia. David was a devout Episcopalian, who willingly married Mollie in the Scottsville Methodist Church, but had no plans to become a Methodist. Mollie and David Patteson became the parents of three children: Frances Evalina, William Lee, and Jennie Nicholas Patteson. When the Civil War broke out in 1861, David joined the Confederacy as a member of the 46th Virginia Infantry and died on April 7, 1865, as the result of wounds incurred at Boydton Plank Road. His widow and three children lived with the Miletus Harrises until Mollie married secondly, Richard Allen Hill on December 21, 1869, in Scottsville. Allen was born on June 13, 1842, in New Kent County, Virgina, and was the son of John Turner and Tabitha (Christian) Hill. Allen, too, was a Confederate veteran, serving in the 46th Virginia Infantry alongside David Patteson and Major James Christian Hill, Allen's brother. Mollie and Allen Hill were the parents of 4 children: John Christian, Mary Allen, Charles, and Henry Harris Hill. Allen Hill died on October 14, 1902, and Mollie (Harris) Hill, on February 4, 1909. (3) John Wesley Harris (1840-1910) - John was born in Scottsville on December 5, 1840, and later attended Dickenson College in Pennsylvania and the University of Virginia Law School. When the Civil War broke out, John joined the Confederate Army with the first company formed from the UVA student body and served until impaired health forced him to leave the army. John returned home to continue his legal studies and was admitted to the Virginia Bar. 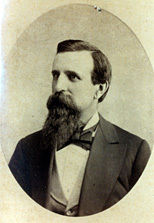 In 1866, John moved to Lewisburg, West Virginia, where he had a distinguished legal career that included the position of Prosecuting Attorney for Greenbrier County. John also organized the Bank of Ronceverte for which he served as its president for many years. John married twice, first to Rebecca Adeline McPherson, with whom he had six children, and, after she died in 1887, John married secondly, Caroline Dora Mason. They had no children. 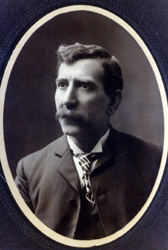 John Wesley Harris died in Lewisburg on December 20, 1910. (4) Henry Hartwell Gary Harris (1847-1916) - Henry was born July 2, 1847, in Scottsville and was working in his father's store when the Civil War broke out. When two of his male role models joined the Confederate Army (Major John Wesley Harris and David Patteson, his sister's husband), Henry naturally was anxious to do his part for the cause. However, his mother was adamanently opposed to his enlistment, causing him to slide down a porch column of the Harris family home one spring night in 1864 and escape. Henry made his way to the north and enlisted as a private in Mosby's Rangers. Henry was captured near Snickersville (now Bluemont, Virginia) and spent the remainder of the war in Union prisons. After the war ended, Henry returned to his Scottsville home, and the remainder of his life was peaceful. Henry never married, but lived with his younger brother, Charles Bascom Harris. After their father's death, Henry and Charles managed 'Harris Merchandise' together. Henry proved to be a good salesman and beloved by his nieces and nephews, who fondly referred to him as 'Nunk.' Helen Harris, his sister-in-law, chuckled about how 'Nunk' loved his mint julep, insisting that he never had more than one, when in fact Henry simply kept replenishing the bourbon in his first glass. Henry remained actively involved in Scottsville's civic, veteran, and religious affairs. He served as Master of Scottsville's Masonic Lodge; Adjutant of the Henry Gantt Camp, U.C.V. ; and choir director for the Methodist Church for many years. Henry Harris died on February 23, 1916, in Scottsville. (5) Charles Bascom Harris, Sr. (1851-1930), Charles was born on June 16, 1851, and was only 10 years old when the Civil War began. However, he witnessed first-hand the destructive assault on Scottsville by General Sheridan in March 1865. As the Union troops destroyed the James River and Kanawha Canal and burnt many Scottsville buildings, Charles valiantly helped his father save the store building adjoining Harris Merchandise from flames. Seeing the youngster so bravely engaged, General Sheridan specifically ordered his Yankee troops to "help that old man and boy in protecting their property from burning." After the war, there was no money to send Charles or Henry, his brother, to college, and instead the two brothers ran the Harris family store. Charles had a knack for the mercantile business and was an excellent salesman. His descendants recall a story about Charles selling an overcoat to a customer on a hot July 4th. On the way home over the Scottsville Bridge, the customer got so mad, thinking about how Charles Harris had sold him the heavy coat on the 4th of July, that he lost his temper and pitched the coat into the James River! Charles married Helen Goddin (Crafton) Harris on December 1, 1879, and lived at Fairview (now High Meadows) in Scottsville. Charles and Helen became the parents of six children: Annie Parker 'Parke'; Charles Bascom, Jr.; Frances Waller; Marjorie; Helen; and Henry Miletus Harris. Charles Bascom Harris, Sr., died in 1930 in Scottsville. Helen (Crafton) Harris died in Charlottesville at the age of 98 years. The photos of Frances Caroline, John Wesley, Henry Hartwell Gary, and Charles Bascom Harris, Sr., are part of the Katherine Ellis collection. Katherine resides in Scottsville and is the granddaughter of Charles Bascom Harris, Sr., and Helen (Crafton) Harris. The photos of Miletus and Mary Susan (Mollie) Harris are from the Mimi Erb collection. Mimi resides in Roanoke, Virginia, and is the granddaughter of Mary Susan (Harris) Patteson and her second husband, Allen Hill.